This story originally aired on February 11, 2019. A voter-approved ban on electronic smoking devices in workplaces is moving forward in the Senate, without a proposal by anti-smoking advocates to redefine vaping devices as tobacco products. 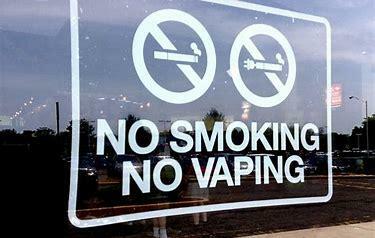 The Senate Innovation, Industry and Technology Committee last week backed a bill that would carry out the part of Amendment Nine that bans vaping in some indoor locations. The proposal, bundled by the Constitution Revision Commission with a prohibition on drilling for gas and oil in state coastal waters, gained 69 percent voter approval. Calls for amending the bill to add the tobacco definition are coming from a number of anti-smoking groups. The measure mirrors a longstanding ban on smoking tobacco in indoor workplaces and would add vaping to a state law that bars people under age 18 from smoking tobacco within 1,000-feet of schools. “It’ll lead to confusion; probably more lawsuits relating to the determination of what is and what isn’t smoking and vaping,” said Mark Landreth with the American Heart Association, who also told the panel that they need to get a handle on the terminology surrounding the issue. Anti-smoking advocates argue that vaping materials are already regulated the same as tobacco by the U.S. Food and Drug Administration and that defining devices as tobacco products by the state would help Tobacco Free Florida’s educational efforts. As with the tobacco law, e-cigarette use wouldn’t be restricted in private residences, stand-alone bars, designated hotel rooms, and designated smoking rooms at airports. However, the measure would give local governments the ability to impose more-restrictive regulations on vaping. That concerns Sen. Randolph Bracey (D-Orlando), who says many vape as a way to quit tobacco. After the hearing, Committee Chairman Wilton Simpson called the argument to add tobacco to the vaping bill language a bit of an overreach. Under Florida law, only the state can regulate smoking tobacco. The committee did not amend the measure to include e-cigarettes. The bill does not have a companion bill in the House.